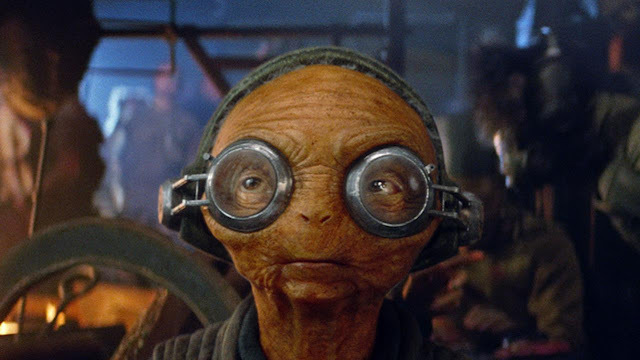 Maz Kanata quotes from the 'The Force Awakens'. Played by actress Oscar Winning and Blank Panther Lupita Nyong’o', Maz Kanata is a supporting character to the main players of the film. The role however is pivotal in that her knowledge is able to bring the characters together, in a sense Maz is the Yoda of the film. She's apparently over 1000 years old, thinks Chewbacca is her boyfriend and appears to have a strong connection / understanding of the Force. Maz Kanata: Han Solo! Where's my boyfriend? Han Solo: Chewie's working on the ship. Maz Kanata: I like that Wookiee. "The Force, it’s calling to you. Just let it in"
"Dear child! The longing you seek is not behind you, it is in front of you"
"I have lived long enough to see the same eyes in different people. I have seen your eyes, I know your eyes!" "Hope is not lost today. It is found." "You must face them, fight them." Maz played an even smaller role in The Last Jedi, you could even call it a cameo. “Oh yes he can”, speaking fondly of the Codebreakers abilities. "Sorry Kiddo, this is rarified cracking. If you want to get on that Star Destroyer, I only know one option. Find the master Codebreaker".